Custom Heart Pulse Rate and Calories Monitor Watch Personalized in Bulk. Promotional, Inexpensive. High Quality at the Best Price in USA, Canada. Wholesale pulse rate watches, custom imprinted with your logo or message. Our Heart/Pulse Rate and Calories Monitorand Watch is ideal for individuals who have lifestyle goals and those who are looking for a weight management tool that will give them personalized feedback. You can take control and decide what you want to do : lose weight, gain weight or simply maintain your shape. Take your first steps towards a healthier lifestyle. Wearing the Heart /Pulse Rate Monitor Watch is like having a personal trainer right on your wrist! Excellent workout companion! Budget Prices in the USA and Canada for wholesale pulse rate watches . American clients pay no taxes, . We will send you a proof for your approval before production. 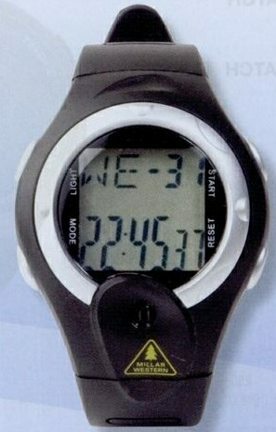 Digital Display Watch with Alarm. Typical Production Time: 3-4 weeks after art approval; Rush Delivery is available: contact us.